This is it! The moment you've all been waiting for! We've got a free-flowing, fun-filled evening in store for you! Don't worry about trying to eat dinner before you get here, or worry about going out after. We got ya covered! Couples or solo, all are welcome! Check it out! ~ We have catering from Manila Express! 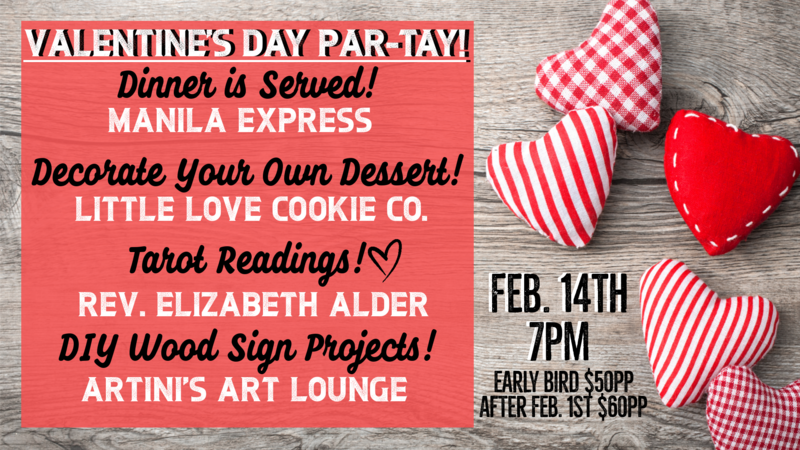 ~ We have Little Love Cookie Company here to help you decorate cookies with your sweetheart! ~ We have Rev. Elizabeth Alder doing Tarot readings to help guide you into 2019! ~ And of course we have ARTini's Art Lounge to provide you with fun wood projects you & your honey can create. Ticket price includes everything except alcoholic beverages. Early bird pricing is $50pp through the end of January. Feb 1st & onward is $60pp. Manila Express is Athens' first Filipino food truck founded by 2 fav locals, Alfredo & Rachel Barnes - Personal/Commercial Stylist. They're kind of a big deal around town & their food truck biz & food is exceptional. Jennifer, the founder, baker, and decorator extraordinaire of Little Love Cookie Company creates some beautiful and delicious edible artwork. You'll have so much fun decorating your desserts! 2 cookies per person/4 per couple). Rev. Elizabeth Grace Alder gave her first and accurate Tarot reading at 17 yrs. old. Her many teachers include Dr. Lynn Buess, author of The Tarot and Transformation, German neurologist Dr. Robert Hasinger, author of Colorenergetics. A published author herself, Elizabeth has channeled thousands of readings and healings for over 30 years. Kate of ARTini's Art Lounge is excited to offer you some DIY wood sign projects so you don't have to watch or listen to her guide you through a painting. Pick from 1 of 5 pre-cut stencils (Valentine's or Love related designs, of course) and DIY. Yes, she'll be here to help. **Special event! No gift certificates, promo codes, or punch cards please.